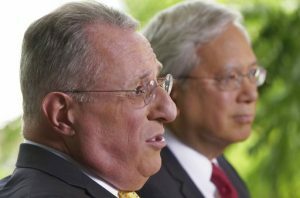 SALT LAKE CITY (AP) — The two newest members of a top Mormon governing panel said Thursday that they hope to bring a new perspective as the first Latin-American and the first person of Asian ancestry to a previously all-white top leadership group that helps make church policy. 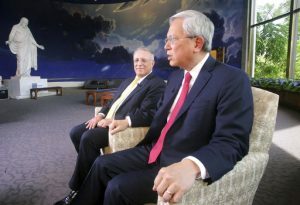 Ulisses Soares of Brazil and Gerrit W. Gong, a Chinese-American, made the comments during their first media interviews since being chosen for The Church of Jesus Christ of Latter-day Saints’ leadership panel called the Quorum of the Twelve Apostles earlier this year. The selections of Soares and Gong as new members of the Quorum of the Twelve Apostles during a church conference on March 30 triggered excitement among many Mormons who for years have been hoping for the faith’s top leadership to be more representative of a religion has more than half of the its 16 million members outside the United States. 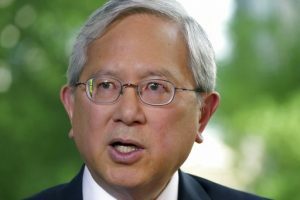 Soares, 59, said the religion’s direction won’t change because that’s always led by Jesus Christ, but he said he and Gong can enhance the church’s capacity to meet the needs of an increasingly global religion that now that has more than half of the its 16 million members outside the United States. “The more places we go, the more people we understand and meet with, the greater we see that love which is a universal love,” Gong said. The religion has come under scrutiny recently for how it handles sexual abuse reported to its local lay leaders, including several lawsuits that allege church officials didn’t properly pass along the reports to police. A new lawsuit was filed this week by a woman who says her father sexually abused her as a child and that Mormon church leaders allowed the sexual assault to continue by failing to report it to police. Gong and Soares both echoed recent comments by top leaders that the religion has “zero tolerance” for abuse and said they offering training and support for local leaders about best practices. The religion recently issued an updated set of guidelines for how the male bishops should handle sexual assault reports. The guidelines direct them never to disregard a report of abuse — a more direct instruction than previous guidelines — and to call a church hotline that will help them sort out how to help victims and report the crime.